CFG Charities was formed to provide a professional conduit for successful business and sports leaders to give back to their community through charitable activities. 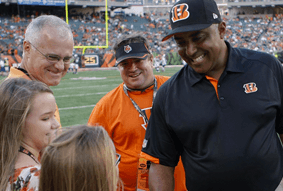 Originally formed in Ohio, as an effort to assist Cincinnati Bengals coach Marvin Lewis promote his own foundation, and after continued involvement with Kentucky basketball coach John Calipari, it was clear that the ability of multiple celebrities, representing multiple fields, could coordinate their individual networks into an effort that wildly exceeded the ability of any of the individuals by themselves. With this goal in mind, Celebrity Foundation Group Charities (CFG Charities, Inc.) was born. To leverage these opportunities, senior CBS Sports legend and multiple Emmy winning NFL Network producer BobGoodrich; five time US International Cheerleading Team gold medalist and team captain Amanda Scripture Robertson;nationally recognized financial architect and business celebrity John Konop engaged the services of Oriana IT Solutions (an Azure Microsoft Partner) and Charles Robertson,retired former judge and nationally recognized author in business law to put together a framework through which hundreds of athletes, coaches, sports representatives and business moguls could contribute their personal networks toward giving back to the dozens of charities with which they have some association. This network of individuals was able to collaboratively engage national media networks and sports agencies with opportunities to further the mission of their individual associations and multiply the opportunities presented to any one individual. Through CFG Charities, it is our goal that hundreds of thousands of dollars can be directly raised to assist the worthy goals of charities across the country, and in the process, any additional funds raised are specifically earmarked for local nondiscriminatory charities, such as Never Alone Ministries. John Konop is the nationally recognized payment architect behind payment systems implemented by Chase Bank, Greystone Business Resources, and dozens of online and payment gateways. John brings a wealth of business and management expertise to the company, as well as a certain level of gravitas opening doors to Fortune 500 companies and their resources. John will be responsible, as Chair, for the management and direction of the enterprise. Bob Goodrich is a Texas sports legend, an All American at SMU and decorated producer for CBS sports (including theOlympics, NFL and College Football, World Cup, and every major sporting event of the last two decades). He is responsible for coordinating and engaging CFG's opportunities and applying his broad knowledge of interrelated groups to provide growth opportunities for individual events. Amanda Scripture Robertson is the five time gold medal team captain of Team USA Cheer and has competed internationally retiring with an undefeated record against international competition. 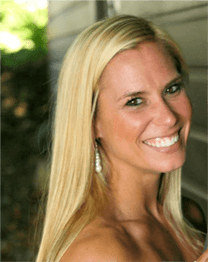 A cheer coach at both the local and collegiate level, she brings a wealth of enthusiasm and boundless energy as a Trustee and brand ambassador. Charles Robertson is a semiretired former judge, attorney, author and Mensa technology architect of some of the nation's most successful public private partnerships. His responsibilities will be for the documentation and protection of the brands involved and compliance. Bob Goodrich, a 16-time Emmy-award winning producer, has come to long way since the days of traveling around the country at his own expense for ABC Sports. Goodrich,who has worked on some of sports' most-memorable telecasts since 1970,is currently a freelance television producer, director, and consultant for companies including ABC/ESPN, SEC Network and the NFL Network. He also owns with his wife, Annie, a media training company - Sportscast Stars Training. Mr. Konop President of GBR Funding, he is responsible for providing alternative financing for small to medium sized businesses ranging from $20,000 to $2,500,000. 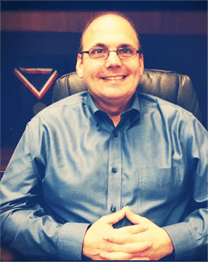 John received his initial training at Citibank ( promoted numerous times and president club winner),and continued to work in the bank, payment processing, and alternative funding industry since 1988. Prior to joining GBR , he was the President of ISO Investment Funding, he created and raised capital for a successful working capital lending product for third party sales forces. In years prior, Mr. Konop was the Chief Development Officer and President of the first nationally successful company to factor credit card sales, AMI/ CAN Inc. where he directed the day to day management, created products, set strategies and goals, and led a team of professionals. Also he was part of successful executive management teams with Gensar, First Savings Bank Credit Card Division and First Premier Acquiring Division that were old sold for above industry standards for ROI. He has a B.S. in Urban Administration from the University of Cincinnati. Amanda is a dynamic individual with a variety of disciplines and talents. She is a 5 time gold medalist for Team USA Gymnastics which she captained for five years from 2008 to 2013. Amanda is also a 5-Time Maine State All-Around USAG Gymnastics Champion. Her professional career includes Planet Cheer, Gymnastics Academy of Atlanta, Legends Elite, Q97.9 radio station. In her current role at PPG Promotions, she is brand ambassador for prestigious companies such as Budweiser, Guinness and Pinnacle Vodka. Amanda has built an impressive education resume while earning her many degrees. She has attended West Virginia University, University of Southern Maine and is currently studying at Kennesaw State University. 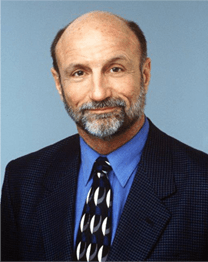 Goodrich started his career at ABC on a part-time basis, performing various duties on different sports telecasts before joining ABC Sports full-time as a production assistant, in 1971,quickly becoming an associate producer in 1973 and elevating to producer in 1976. From 1980-86, Goodrich served as producer of ABC's NFL's Monday Night Football. During this period, Goodrich served as the producer for the network's first- ever coverage of the Super Bowl (XIX) in January of 1985. Additionally, Goodrich spearheaded the production of the pre-game and halftime programs during the Super Bowl XXV, held in Tampa in 1991. Preceding and following his stint as the producer for MNF,Goodrich worked on ABC Sports' coverage of College Football,fifteen years as producer, prior to eight as a coordinating producer. Additionally, Goodrich served as the coordinating producer of 1998 World Cup of Soccer, and oversaw the production of ABC Sports' live coverage of the Indianapolis 500 for 16 consecutive years. Goodrich served as the producer of the network's basketball coverage at the 1976 Summer Olympic Games as well as its hockey coverage at the 1976 and 1984 Winter Olympic Games. Goodrich also oversaw the production of the speed skating events at the Lake Placid Winter Olympic Games in 1980,gymnastics at the Los Angeles Summer Olympic Games in 1984 and the Alpine coverage for the 1988 Winter Olympics in Calgary. Throughout the span of his career at ABC,Goodrich produced the coverage for numerous major golf championships, including the U.S. Open, British Open and PGA Championship as well as a variety of Wide World of Sports events, including the World Track & Field Championships, World Alpine Skiing Championships, plus boxing and auto racing. Goodrich also served as producer for the North American Soccer League, ABC's Monday Night Baseball telecasts and has directed golf, auto racing and football telecasts. A native of Dallas, Texas, Goodrich was an All-American high school split end and is an alumnus of Southern Methodist University. While at SMU, he was an outstanding four year letterman tight end and played in the 1967 Cotton Bowl. He was recently inducted into two Hall Of Fames-the Texas High School Football HOF and the Woodrow Wilson High School HOF. including the U.S. Open, British Open and PGA Championship as well as a variety of Wide World of Sports events, including the World Track & Field Championships, World Alpine Skiing Championships, plus boxing and auto racing. Goodrich also served as producer for the North American Soccer League, ABC's Monday Night Baseball telecasts and has directed golf, auto racing and football telecasts. Goodrich lives with his wife Annie Hoffman and their three children in Atlanta, Georgia. Amanda is a dynamic individual with a variety of disciplines and talents. She is a 5 time gold medalist for Team USA Gymnastics which she captained for five years from 2008 to 2013. Amanda is also a 5-Time Maine State All-Around USAG Gymnastics Champion. Her professional career includes Planet Cheer, Gymnastics Academy of Atlanta, Legends Elite, Q97.9 radio station. In her current role at PPG Promotions, she is brand ambassador for prestigious companies such as Budweiser, Guinness and Pinnacle Vodka. Amanda has built an impressive education resume while earning her many degrees. She has attended West Virginia University, University of Southern Maine and is currently studying at Kennesaw State University.